John 11:25: I am the resurrection and the life. 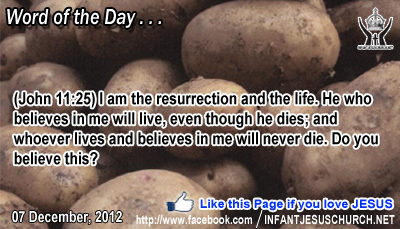 He who believes in me will live, even though he dies; and whoever lives and believes in me will never die. Do you believe this? Heavenly Father, we believe that because you have adopted us into your family, that death will never claim us. Help us live with new energy and confidence knowing that Evil cannot have us and death cannot claim us because we are yours through Jesus, your Son and our Lord, risen from the dead. In the name Infant Jesus we pray. Amen. In Jesus we see the fullness of God's mercy and the power of his kingdom - power to save from death and destruction, to pardon our sins and lift the burden of guilt, and to heal infirmities and liberate the oppressed. Jesus never said no to bring God's mercy to those who sincerely sought it. How can we seek and obtain God's mercy? God gives mercy to the lowly in heart – to those who distinguish their need for God and for his forgiveness and healing power. God wants to change and transform our lives to set us liberated to live as his sons and daughters and citizens of his kingdom. Faith is the key to this change. How can we grow in faith? Faith is a gift freely given by God to help us know God in person, to understand his truth, and to live in the supremacy of his love. For faith to be successful it must be linked with trust and obedience - an active submission to God and a readiness to do whatever he commands. The Lord Jesus wants us to live in the sure expectation that he will accomplish his promises to us and bring us into the fullness of his kingdom - a kingdom of righteousness, peace, and joy in the Holy Spirit. Loving Infant Jesus, help us to draw near to you with faith and trust in your saving power and mercy. Free us from doubt and skepticism that we may approach you confidently and pray boldly with hopeful faith. Let your kingdom come and may your will be done in us.